If ever there was a living example of "speak softly, but carry a big stick," Junior Dos Santos is it. Poised to take a run at the UFC Heavyweight Title, Junior gained a great deal of popularity on last season's TUF, when people got to see the quality kind of person that he is. Now less than two months away from making history when he steps into the cage in the first network television live UFC event, Junior is as humble as ever. Don't let that humility fool you, though. His demeanor may be calm, but his fists pack a storm worth of hurt. Mark Figula for The Mouth of MMA: You will be headlining the first ever major network UFC card on Fox, this November, How does it feel to be a part of history like that and does it add to any excitement on your part for the fight? Junior Dos Santos: It's exciting, and I am thankful for the tremendous opportunity the UFC decided to give me. Both Cain and I are exciting fighters, and sure to keep everyone on their toes and win some new fans for the sport. It definitely gives me extra motivation to train hard, and to win. I want that belt really bad. Mark: How - if at all - do you think that Cain's layoff from being injured will impact his abilities in the ring come fight time? Junior Dos Santos: I don't think at all. People talk about cage rust and whatever, but Cain is a professional athlete, and the current heavyweight champion. He would not accept a fight if he couldn't give it his all. I expect to get a fierce Cain Velasquez in that octagon, and I expect he'll be my biggest challenge to date. Mark: What do you see as his greatest strengths coming into this fight and where do you feel you have the best advantage? Junior Dos Santos: Cain is great everywhere. He has spectacular take-downs and wrestling, vicious ground and pound, and he's a good striker. But I think his biggest strengths are his speed and his cardio. As far as advantage, that's tough, because you never know where a fight will end up. They are always unpredictable, and I will be ready for wherever this fight ends up. Everybody considers me a striker, and it doesn't escape me that a lot of people think Cain will take the advantage if we wind up on the floor, but the truth is nobody has seen my ground game yet. It might be nice to surprise people with a few takedowns or maybe a submission. "...the truth is nobody has seen my ground game yet. It might be nice to surprise people with a few takedowns or maybe a submission." Mark: How important is it to you to bring another belt home to Brazil? Do you think in terms of this being for your country? Junior Dos Santos: I think of this fight as a personal achievement-- to be from were I'm from, to grow up how I grew up, and to be here today, fighting on Fox for the heavyweight title, is spectacular. I am Brazilian, of course I have a sense of country and of course it would be great to bring the belt to Brazil, but this fight is about my blood sweat and tears, about working hard and never giving up. So for me, it's about my dream coming true. I think Cain and I are a lot alike. We're Latinos, from similar socio-economic backgrounds, who worked really hard to get where we are. Mark: If you win the belt, you will face the winner of Lesnar - Overeem... I know it's hard to think past the fight right in front of you, but just as a quick thought, does it matter to you which of those two guys you face? Junior Dos Santos: No. It doesn't matter. I will fight whoever the UFC thinks should be my next fight. For me, what matters is that I get to fight. It's what I was born to do. It's what I love to do. Mark: With the Strikeforce Grand Prix going on, who do you think will win it? Junior Dos Santos: I don't know. I wasn't expecting this finale. I don't think anybody was. Mark: At this level, every fighter is tough, but who was the toughest for you to face so far? Junior Dos Santos: I think Cain will be the toughest yet. Of those I've already fought, I'll go with the two who I didn't knock out. Roy Nelson and his chin were tough as nails and I was impressed with him. I'll also go ahead and say he is a great guy. He came and visited me when I was doing TUF, he met with my team, and it meant a lot to me, so I have respect for him as a superior athlete and as a person. and I was impressed with him." Then, at UFC 131 against Shane Carwin, obviously like everyone else I was impressed with his ability to fight through the third round, but I was also impressed by his punching power. There was a shot in the first round that he landed to my face and I definitely felt it. I sort of went "whoah" and then decided it would be better to stay a little further out from him and jab more so I wouldn't have to take too many of his punches to the face. Mark: Speaking as a fan of MMA instead of as a fighter, what is a dream match-up you would like to watch? Junior Dos Santos: I would love to see Big Nog fight Fedor again. Mark: Your nickname, "Cigano" means "gypsy" in English. How did you get that nickname? Junior Dos Santos: When I started fighting and still had hair, I wore it long in a ponytail. People said I looked like a gypsy and the guys at training started calling me "Cigano" to mess with me. I didn't like it and asked them to stop, so... They did it more and more and it stuck. So, now I'm "Junior Cigano," which is how a lot of fans refer to me, especially in Brazil. Or just "Cigano". Even my twitter is @junior_cigano. Mark: I think everyone got to see what a good guy you are during TUF. Can you tell us anything about being on that show that we might not already know about? Junior Dos Santos: Thanks for that. That show was a great chance to get more exposure to American fans, and to learn more about American culture. I loved the experience and am still in touch with several of my teammates. But, it was also a really hard experience for me. My English was pretty awful, especially at the beginning and it was so difficult to communicate exactly what I wanted to tell my team. It's frustrating and I think only somebody who has been through that language barrier type of situation can really understand how frustrating it is to not be able to really express what you want. That's why I still use an interpreter sometimes. I am trying really hard to learn English, and Spanish too. I want to be able to communicate and I want people to hear ME, to know what I am saying. TUF was early 2011 and I barely spoke English. It's gotten better. I pay attention to song lyrics and tv shows, and I ask people a lot of questions -- if they use an English word I don't know, I ask what it means. I ask how it's spelled and I pay attention. In another year or two I hope to be fluent. People started interviewing me in Spanish lately too (I don't actually speak Spanish)... It's been funny. I try. I want to learn. I will learn. Mark: Thanks for your time, Junior. There is no doubt that Junior will learn fluent English, just like there is no doubt his MMA game will ever improve. He is soft spoken, yes. He is loathe to brag, yes. He is also a man who accomplishes what he sets out to do. 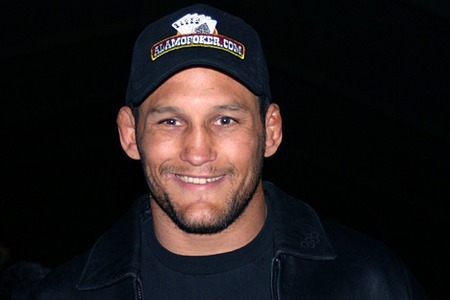 If you want to hear more from Junior, follow his Twitter @junior_cigano. Mark "The Ezequiel" Figula is the biggest wuss to ever enter a cage... The most spindly chickenass dude to ever tap out at NAGA... The boy who was told that the pen is mightier than the sword... And thus he writes. Check out his home page of scribblings at www.markfigula.com. In a quiet strip mall on a not so quiet street, barely 5 minutes from Billy Joel's Hackensack-ack-ack-ack is one of the best places in the country a student of Brazilian Jiu Jitsu can go to learn the gentle art. Headed by Renzo Gracie black belt, Karl Pravec, the instruction at Silver Fox BJJ is reflective of Karl's calm yet determined demeanor. My first visit to Silver Fox was early in the Summer, when I wandered in through the glass door after having spotted the "Brazilian Jiu Jitsu" sign from across busy Market Street. The spacious room on the other side was Spartan but filled with a quiet, positive energy that immediately put me at ease. Having been to (and oft-reviewed) over a score of schools across the country, I have walked into all manner of situations, never quite sure what to expect. As the class got started that day, what I found was an attentive, highly technical instructor at the helm who paid close attention to what each student was doing. After the usual warm-ups and review of basic movements, the students paired off and worked on one of the new moves for the day. Karl walked around the room, watching closely and making corrections where he saw it was needed. He then showed the move again to the whole class, but now with a review of common mistakes he saw being made. The next step would be to practice the move anew, but with a step up in resistance. While this may seem to be a common sense way to learn new techniques, I can assure you that it is often a missing link in many training programs where techniques are thrown out like so many jacks and a student goes from practicing with no resistance to trying to use it in a live sparring session. Score one for Silver Fox on developing a more refined, tougher jiu jitsu player. I should note that Silver Fox separates "basic" and "advanced" classes such that basic classes work on drilling techniques and don't include sparring. This progression for new students through the basic class before being able to roll live also plays a significant role in breeding fighters who haven't developed sloppy habits. Score two for Silver Fox. My visit was during the advanced class, though and next up was a live sparring session. Most surprising to me was something that is also unfortunately rare at many BJJ schools and that is having your sessions closely watched by the instructor and often his assistant instructor(s) as well. Karl informed the class they would do five minute rounds and then switch partners. He walked over to the timer, got it started and then wound through the room, stopping to observe how his students applied all he had taught them. Anyone who has trained for any length of time knows how important it is to catch mistakes in live sessions and how often one can find an instructor at a school chatting with someone rather than watching what his students are doing. More attention to detail. Score three for Silver Fox. The scoring doesn't end there, though. The aforementioned assistant instructors are worthy of praise as well, sporting a diverse set of talents and perspectives. While it is clear that each has learned to teach through the methods Karl sets forth, each also brings a unique bag of tricks into his class. There is even a healthy dose of wrestling being taught on certain nights, which is something I have been hawking as the missing link in far to many BJJ player's arsenals in today's fight game. You can't use great jiu jitsu if your opponent stuffs every take-down and continues to pummel you to the TKO. Another aspect of the instruction I found to be refreshingly keyed in on was the practical self defense applications of techniques. Often when teaching a new technique, Karl would stop to explain a detail of it that is specific to protecting oneself if it where a non-sport situation. It can be very easy to get caught up in the competition end of BJJ, but it would be unwise to forget what might transpire off a mat. Score five for Silver Fox. Now, after a Summer training with Karl, his assistants, and fellow students, I have seen my game grow in very good and tangible ways. The level of competition, the expertise of the instruction, and the completely positive environment will be tough to match as I travel out and continue to review academies. The bar has been set anew. To find out more about Silver Fox BJJ, visit their website. As a follow up to my piece "Choosing a BJJ School", I'd like to go a little more in depth. For an established competitor looking for a new school, there are additional concerns besides those mentioned in my prior article. Whether moving or just looking to broaden your horizons, there are a few things you might want to look for. My previous article mentions location, schedule, technique, attitude, and variety. All of these attributes are imperative to a good school, but as a competitor we both know; you need more! A coach - Any black belt can qualify as an instructor, and sometimes even the best instructors fall short in this department. To be a good coach, the instructor has to know how to push the athlete and prepare him for the mental and physical hurdles that come with competition. A good coach will study your videos, point out your flaws, and make corrections that see you improving as a student as well as a fighter. Pace - lots of technical, top notch schools practice traditional philosophies. Slow, composed technique paired with relaxed breathing and not "muscling" your moves are commonplace philosophies in this belief system. When training for a fight, we have to move fast! We have to go hard! We have to scramble! While I'll never fully advocate compromising on your technique, the end always justifies the means in competition. Putting that extra bit of force and causing that scramble that gets you a good hard-fought two points could be the difference between victory and defeat. Sometimes we have to train to learn; sometimes we have to train to win. Support - I've seen guys go into tournaments without a coach or even teammate present. I've been there myself when competing on a national level, but you can’t expect many teammates to jump on a plane and miss a week of work because you're competing. If your fight is a stone's-throw away from your gym though, your coach or a representative better be there for you. No excuses! A competition team - if a competitor is surrounded by other athletes who train for fights, they will be forced to go into a mindset of preparation, focusing on the improvement of not only technique, but the will to push forward and reach that next level. Different styles/body types - Training at a small gym has its downsides. No matter how good you are, it gets to a point where if you compete long enough you're going to be surprised. It's important to train with a wide variety of different styles and body types. Being the best guy in your gym and winning countless tournaments won't prepare you for the tall guy whose legs step right over your open guard, only training with somebody with similar attributes will. If your school doesn't have a wide variety of body types and styles for you to roll with, your instructor better be cool with cross training at other academies. Currency - If you're going to be out there in the competition scene, your jiu jitsu has to be up to date. You have to watch recent fights and keep familiar with the new techniques in use. What worked back then may not be what works now. I'm not saying you have to berimbolo, but you have to know what it is in order to defend it. I've been faced with a lot of these dilemmas personally. Having been fortunate enough to train at some of the top competition schools in the U.S., I found myself spoiled. When I came back to the east coast I bounced around tirelessly to find a school that fit the mold of what I needed. It took some time, and probably some name calling behind my back, but I finally found the formula I needed to win. After all, that's what it's all about. Brazilian Jiu Jitsu and MMA schools are everywhere now. Things have come a long way from the days where there might be a school or two in your state, and even fewer black belts to be found. Times and have changed and with the rapid evolution of our sport, schools are sprouting up everywhere. So how do you choose the one that's right for you? I spent a good amount of time traveling the country and visiting some of the top schools out there. In just four years of Jiu Jitsu I have been fortunate enough to have visited 24 of the best schools in the United States, more than most practitioners will visit in a lifetime. I feel that my unique experiences put me in a position where I can critique schools in a way that many can't. I'd like to go through some of the reasons to choose (and not choose!) a school. -Location: This has to be the number-one reason why people choose their school. Coming in fresh and unknowingly, the few brave souls that want to give this "barbaric sport" a try will venture into the academy closest to their house. If you get lucky, Lloyd Irvin or Gracie Barra set up shop right down the road from your house, and you've got a brilliant black belt just a hop, skip, and a jump away. Everything is peachy, and you'll get good in no time! A: some heavyweight monster who looks like he just won his last bar fight. These guys are slamming each other all over the mats with reckless abandon, getting hurt like clockwork, and heel hooking each other like there's no tomorrow. B: a traditional martial artist who feels that his accomplishments in his field of expertise (which are sometimes impressive) combined with his UFC watching experience, allow him to waltz right onto the mat with his black belt on and teach a BJJ class. I'm sorry Mr. Miyagi. It doesn't work that way. -Schedule: It's important to find a place that offers a schedule you can swing. Let's face it, the greatest school on earth won't get you better if your work schedule doesn't allow you to ever make it to training. -Attitude: If you're not surrounded by a bunch of humble guys eager to help you at every turn you're not doing it right. This art is intended to breed a level of humility and promote a friendly training environment. Tough guys walk into MMA gyms all the time (see guy A), but only the open-minded student who checks his ego at the door and is willing to dedicate himself to getting better should be welcome to train at your gym. Lots of guys start off like this as white belts, but if your purple belts are brash bullies, you're in the wrong place. -Technique: For me this is the biggest. Does the stuff I'm being shown really work? If I'm going to be training somewhere, I have to be able to trust the instructor's technique and attention to detail. We've all come across that meathead white belt who thrashes around violently, hurts his training partners, and thinks it's what makes him good. Some schools actually promote this behavior. Can you imagine that guy at purple belt (again, see guy A), learning from his black belt clone? It happens. A good school will focus just as much on defense as it does on offense, probably more. My rule: if you have blue belts who can't upa or elbow-knee escape I am NEVER coming back. -Variety: If you're looking to become a well-rounded BJJ practitioner or fighter, you need a good mixture of gi and no gi. I've been to outstanding schools who just don't balance out their regimens. One of these schools had a curriculum that was about a 90/10 split. Seriously??? What if I'm training solely for self-defense and one day, I'm attacked by an assailant who's not wearing a jacket? No bueno guys! These are just a few of the basic things I'd look for when choosing a school. Thanks to Google, it's pretty easy to get a jump on a place before going in. Do a little homework, and if you're fortunate enough to live in an area populated with a few different schools, shop around and find the place that's right for you. In tonight's bouts, Mr. Shields and Mr. Brookins helped illustrate the point I was trying to make in my "The Evolution of the MMA Fighter" article. Brookins tried repeatedly to get the fight to the ground and ended up getting nothing more than a pale version of an old Randy Couture performance while Shields ate a knee when he attempted an ill conceived take-down. The big winners tonight are clearly Ellenberger and Belcher who both can become relevant in a title picture in divisions where it's becoming difficult to find a compelling opponent for the champion.